Tokyo-based educational company Gakken is recalling 10,000 of their electronic talking Smart Globes following a rash of customer complaints about a mislabeled Taiwan. On the globes, Taiwan -- a self-governing nation that split from communist China in 1949 during a civil war -- is labeled as "Taiwan Island," and the globe's smart pen reader, which streams audio data about a nation's geography, history and culture whenever you touch its location on the globe, identifies Taiwan as part of the People's Republic of China. Gakken had originally intended to use the standard labeling for Taiwan (as per the Ministry of Education's specifications), but the Chinese factory based in Shenzhen apparently refused to produce the globes unless Gakken agreed to label Taiwan as part of China. Gakken agreed to the factory's demands. The company sold out their entire first shipment of 10,000 Smart Globes, which were released in Japan last August, but customer complaints flooded in, prompting a recall. Interestingly, a note included in the box along with each Smart Globe explained that Taiwan's name and data had been changed at the factory based on instructions from the Chinese government. However, at a January 10 press conference to announce the recall, Gakken said that they did not receive direct instructions to make the changes, and that they are investigating why the changes were made. According to a Gakken press release announcing the Smart Globe recall, the company is reimbursing customers the full price of 29,400 yen ($270). 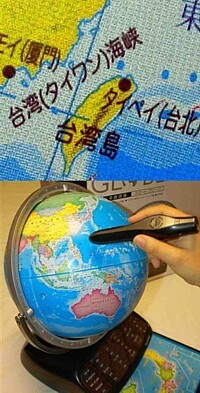 In a similar move, toy maker Takara Tomy also held a press conference on January 10 to apologize to customers and announce a recall of their smart "Talking Globe," which -- like Gakken's Smart Globe -- features a mislabeled Taiwan and was manufactured in China. First Google, now Takara Tomy! China holds all the power! They might want to put those globes in short term storage since the Kuomintang just won a big election victory, bringing Taiwan closer to absorption by China. MIGHT is RIGHT! Any question? !